Once upon a time, bear feeding was as popular (if not more so) than geyser watching in Yellowstone National Park. Indeed, the practice went beyond the occasional scrap tossed to an obliging bruin by the roadside. 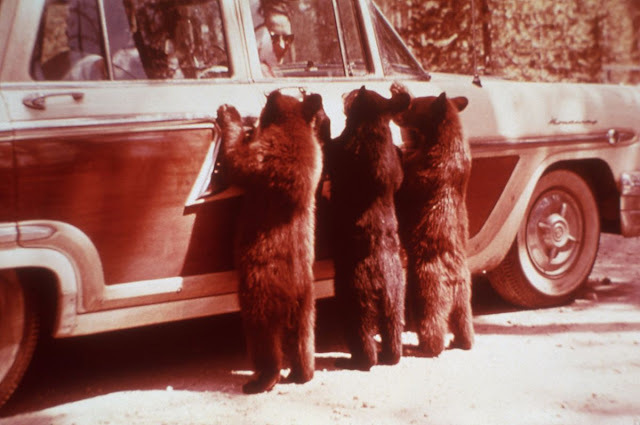 Bear feeding was a spectacle, with huge pits of garbage set up for bears to come root around for sustenance—to the delight of observers. 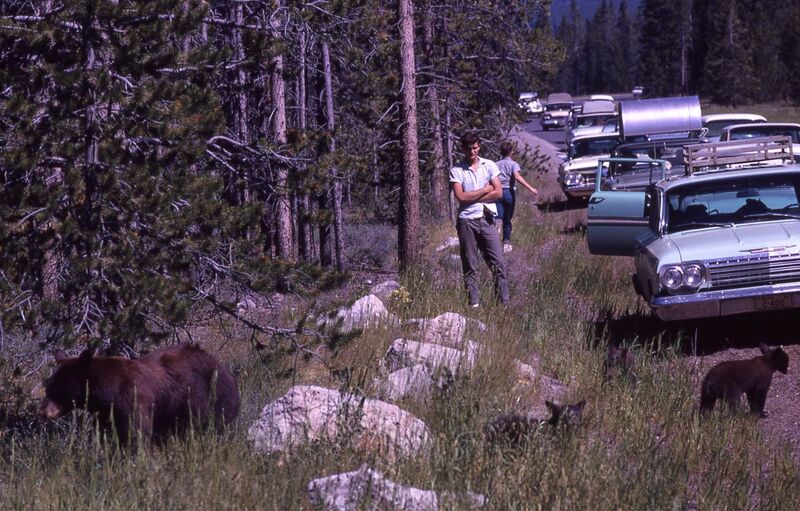 And while you may think the practice as archaic, it was a central part of the Yellowstone experience (both advertised and felt) for decades. 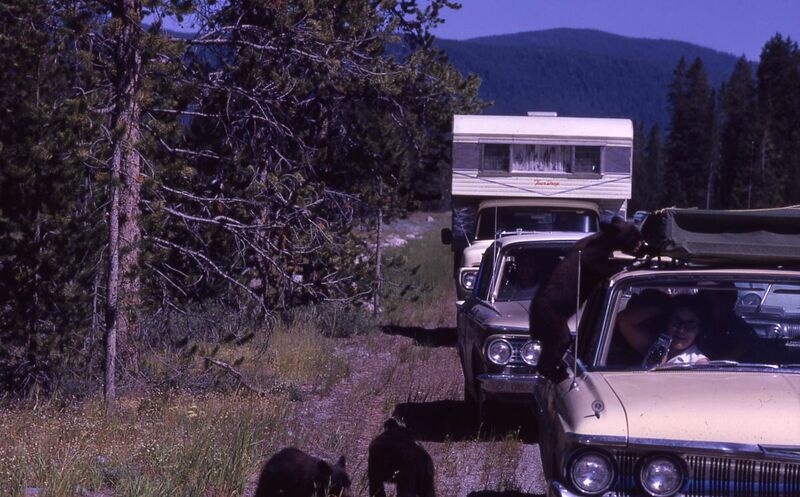 According to Paul Schullery, writing in Searching for Yellowstone, the spectacle of feeding bears garbage arose somewhat by accident. In the late 1880s, as hotels started cropping up around the Park, bears started hanging around hotel garbage dumps. 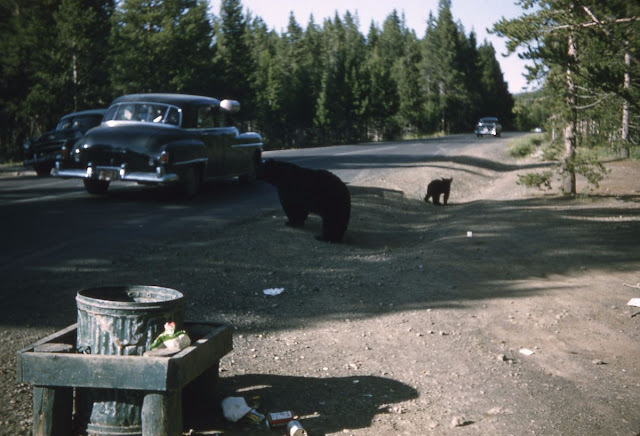 By 1900, “the bear replaced Old Faithful as the most recognizable symbol of the park,” and bear feeding sites cropped up across the Park, rising with the number of visitors. 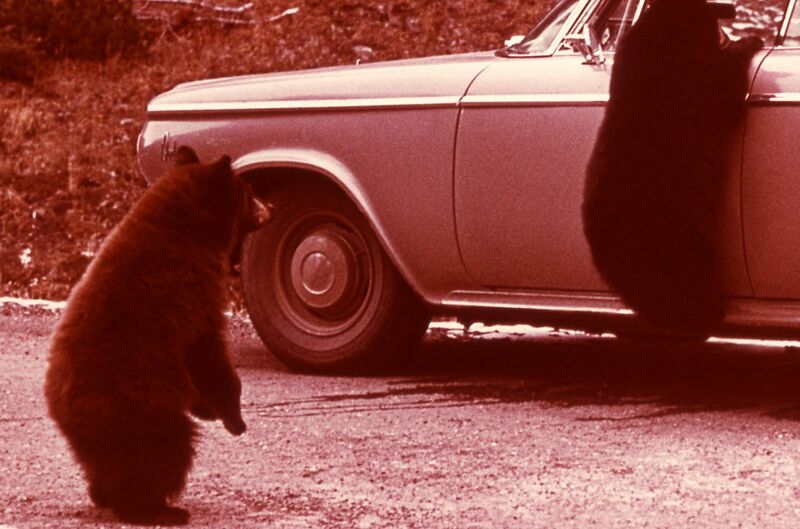 There, under the watchful and interpretive eye of an armed ranger, hundreds of visitors nightly watched crowds of grizzly bears paw through piles of hotel garbage, with the occasional added treat of a loud, spectacular fight to add a thrill to the evening. There was one animal the visitors never had any trouble seeing—bears. 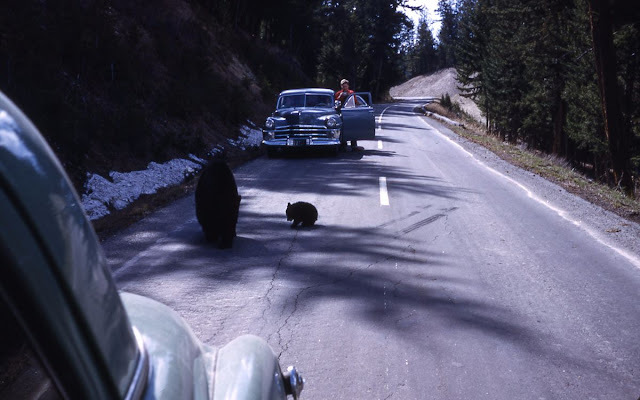 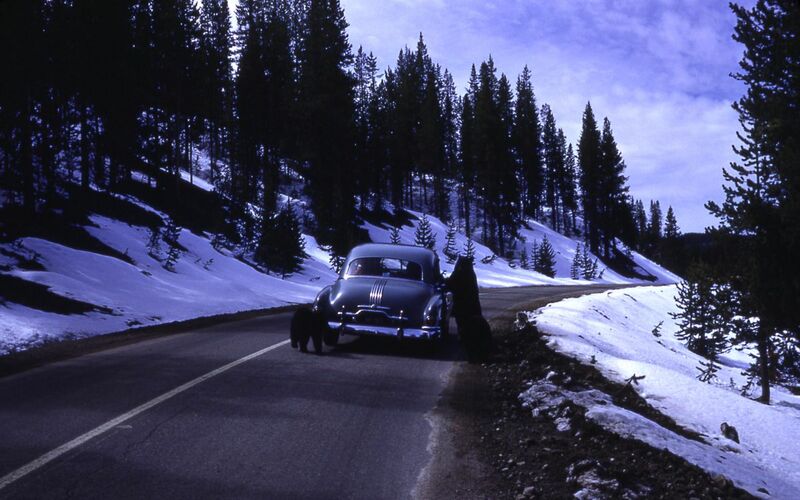 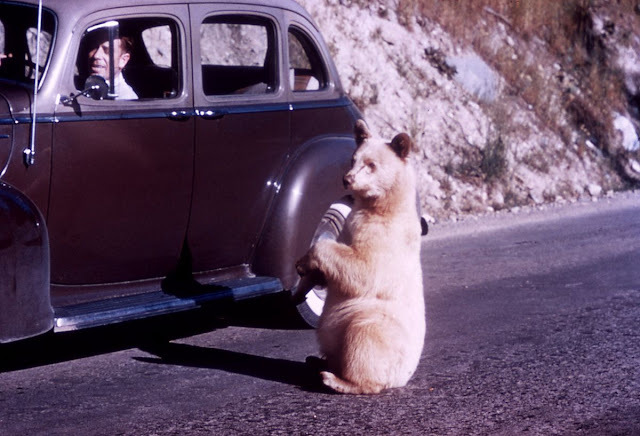 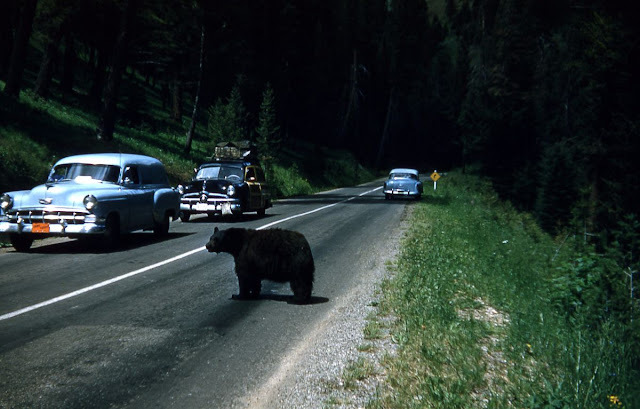 Even though most of Yellowstone’s big population of bears stayed in the wilds, there were a number of black bears that had become what we called “beggar bears,” or “hold-up bears.” They would hang around the roadsides waiting for visitors to stop their cars and throw out food. The bear feeding sites were one big publicity stunt for the Park, one we recognize with a modicum of incredulity—to put it mildly. 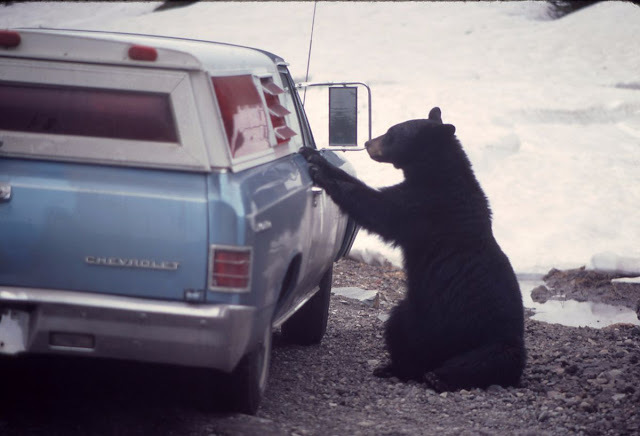 Besides injury and death, bear feeding led to property damage, both from bears clawing up cars and tearing down fences in search of grub. 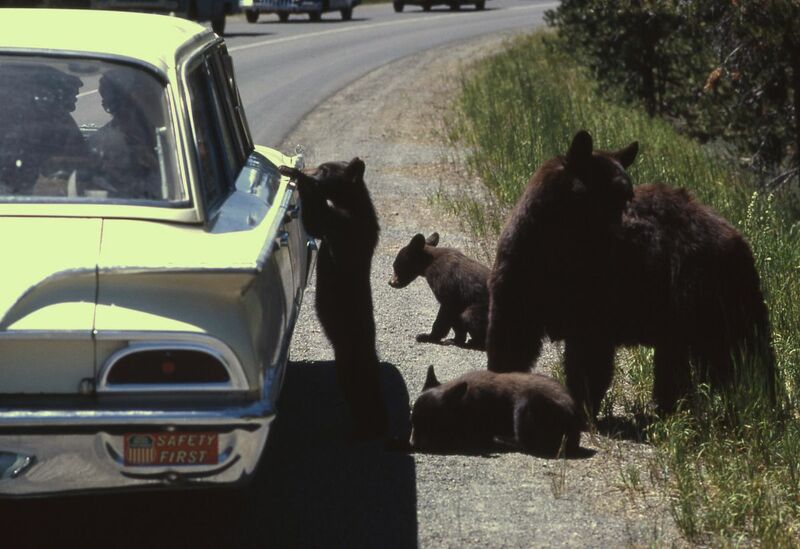 According to the Yellowstone Park Foundation, between 1931 and 1969, there were an average of 48 bear-related injuries to visitors in the Park—and over 100 cases of property damage! 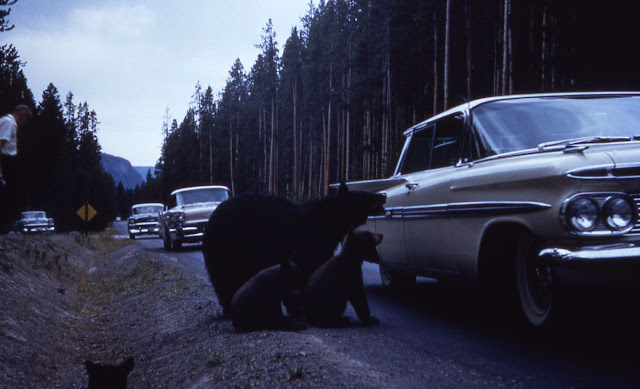 In today’s bearscape, feeding them table scraps, much less constructing sites for their feeding to become spectacle, is unthinkable. 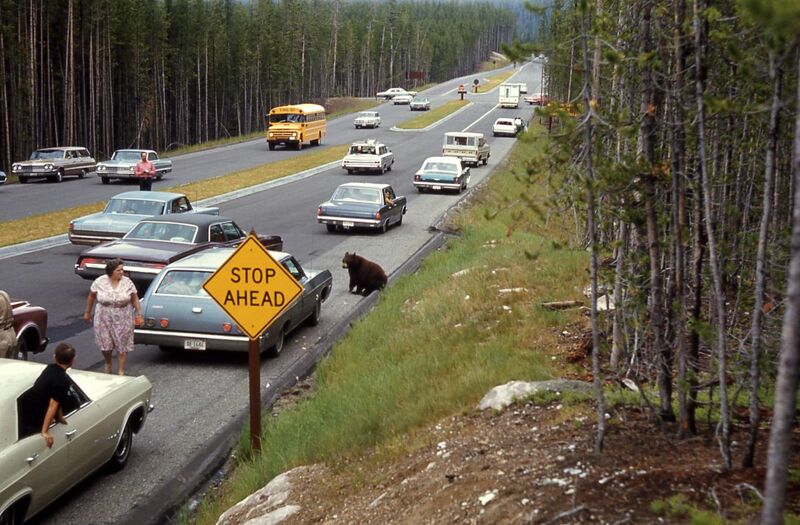 And not even from a safety standpoint. Feeding bears in Yellowstone runs counter to the mission currently espoused by the NPS: to let bears (and other wildlife) live as unfettered and unguided as possible within Park boundaries. 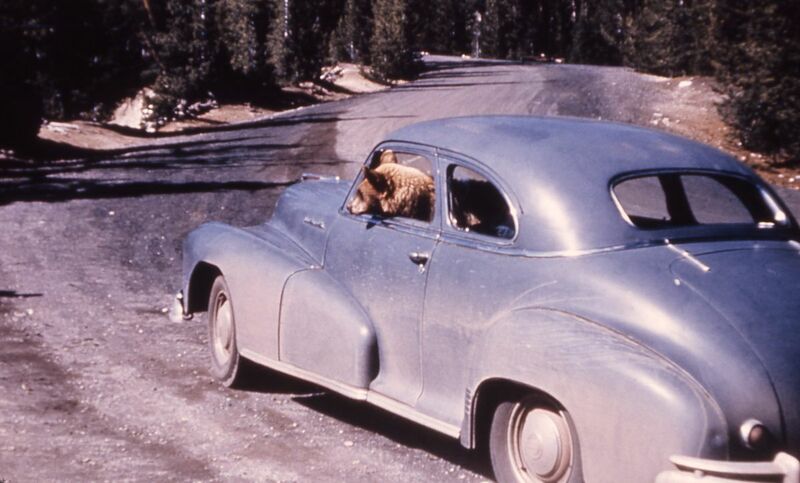 The public “bear viewing” dumpsites started shuttering during World War II, a little over a decade after the Park started tracking human-bear incidents more diligently. 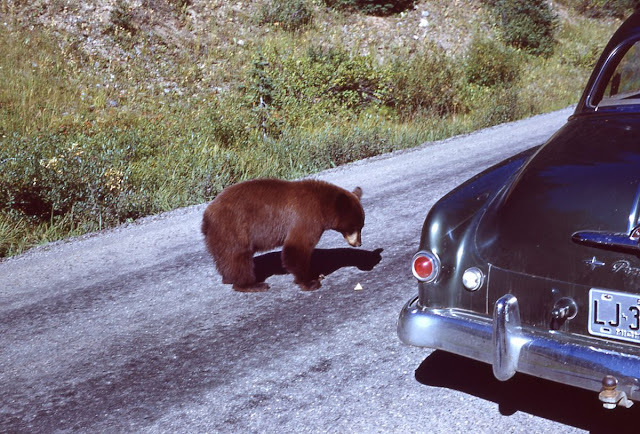 The practice did not really come to a full stop until much later, as “hold-up” bears lingered by the roadsides and bears still frequented garbage dumps within Park boundaries. 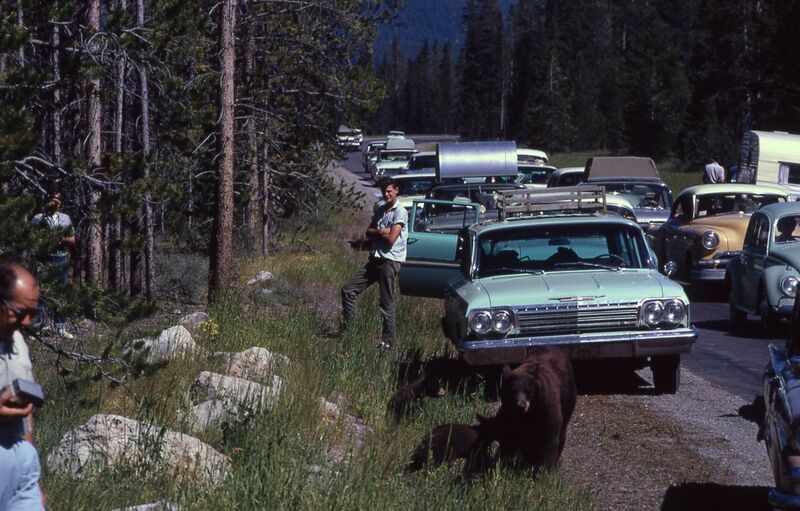 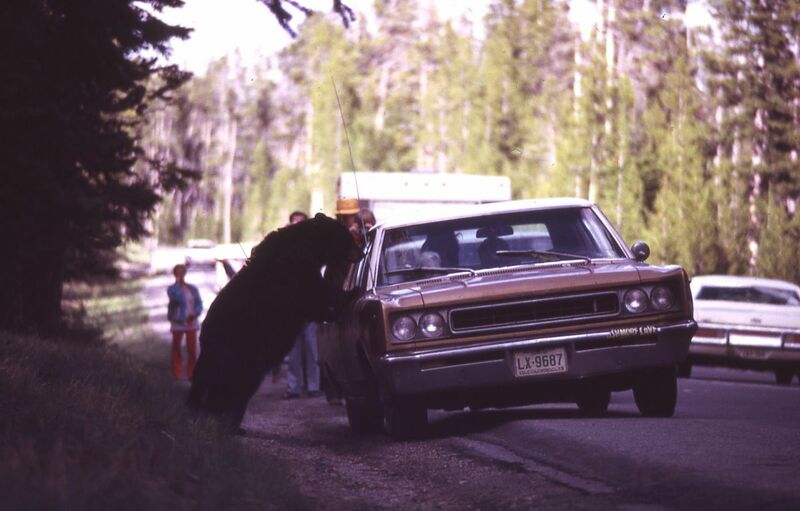 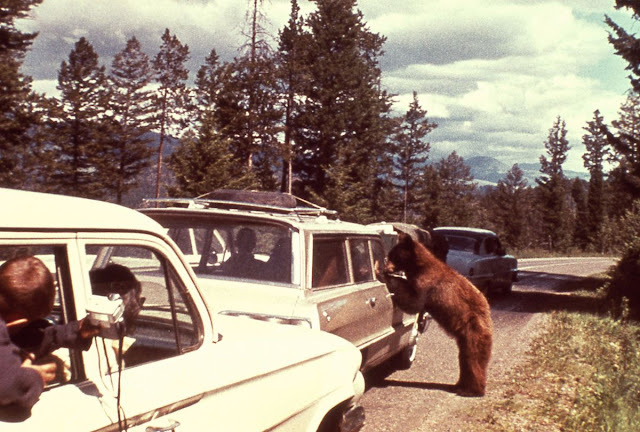 It was not until 1970, when Yellowstone banned visitors from feeding bears and set up bearproof garbage containers around the Park, that bear feeding came to a full stop.